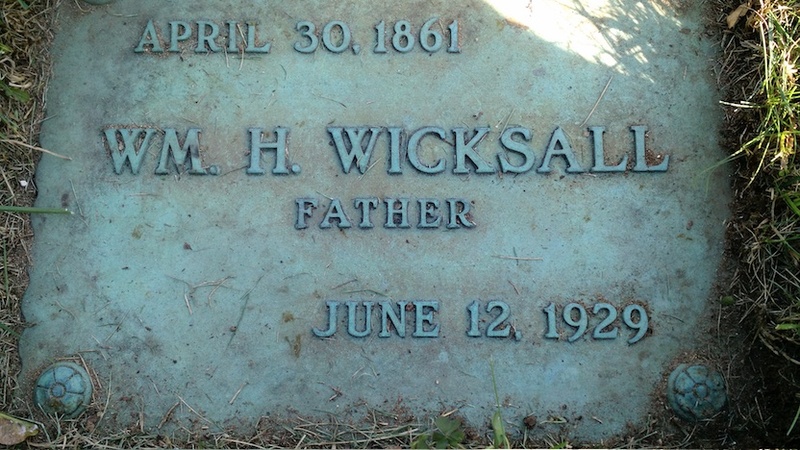 On April 30th 1861 Joseph and Selina’s first son William Hamlin Wicksall was born in Salina, Kansas. The source for his full birth date is his headstone as most other sources just say "abt 1861". The source for his birth place is his son's birth certificate. This certificate was requested many years after the fact so it is possible that his birth place is confused with his mothers name. Salina Kansas did exist at the time so it certainly is possible. The next time we see him is on the 1870 United States Federal Census listed as Willie, Age 9, born in Kansas and living in Paw Paw Michigan. In the January 09, 1874 issue of the Paw Paw newspaper “The True Northerner”, you find “a report of the school taught in District No. 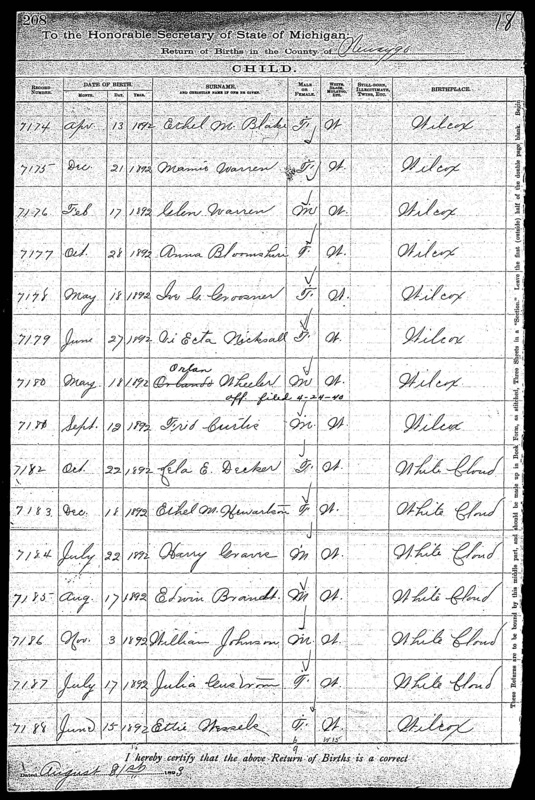 4 of Paw Paw for the first month; ending Dec. 26th, 1873.” In that report there is a list of “star scholars” with William Wicksal in B spelling class. The report is on the bottom right of the page. 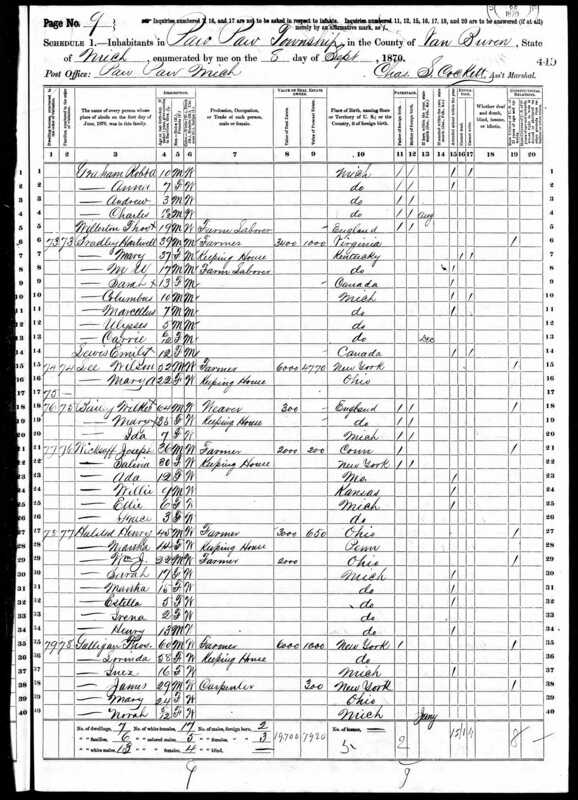 The 1880 United States Federal Census shows William, age 18, living in Pine Grove Michigan with his father and younger siblings. 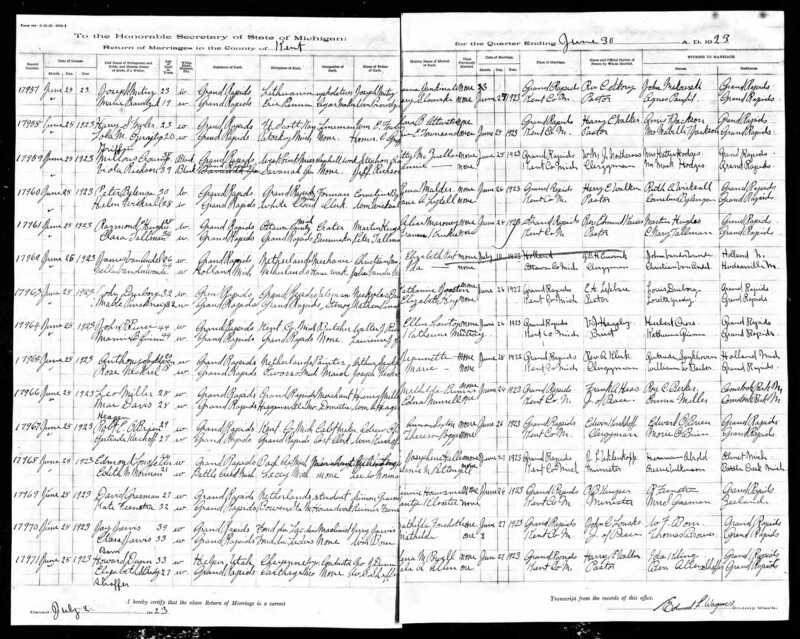 On November 26th 1882 William Hamlin Wicksall married Addie J (Jane Adelaide) Lytle in Breedsville Michigan. William is listed as a 21 year old farmer born in Kansas, Addie is 18 and the residence of both is listed as Breedsville, Van Buren County Michigan. Witnesses were E. D. Lockard and E. Hinkley of Breedsville. Addie's birthplace is listed as Breedsville. "The village of Breedsville, which occupies the site of the oldest settlement in the northern part of Van Buren county, derives its name from Silas A. Breed, who was one of the first men to locate lands within the limits of the present township of Columbia, which, at the time, was a part of the township of South Haven." "The village was incorporated by act of the legislature in 1883"
"The first officers of the village were as follows: President, Norman H. Adams; clerk, E. D. Lockard; treasurer, James M. Gray ; assessor, N. J. Cranmer ; trustees, F. E. Sherwood, E. S. Hogmire, A. D. Enos, Jay P. Gilman, William H. Wicksall, William Cushman; street commissioner, N. W. Smith; constable, Aaron Miller ; marshal, E. Carter, Jr. ; health officer, P. P. Robertson; fire warden, D. M. Miller; poundmaster, Henry Scrimger ; special assessors, James M. Gray, N. W. Smith and Solomon Snell." Breedsville is the birthplace of the first two of William's children. On July 28th 1883 Olive Salena Wicksall is born and on December 12th 1886 Joseph Alexander Wicksall is born. 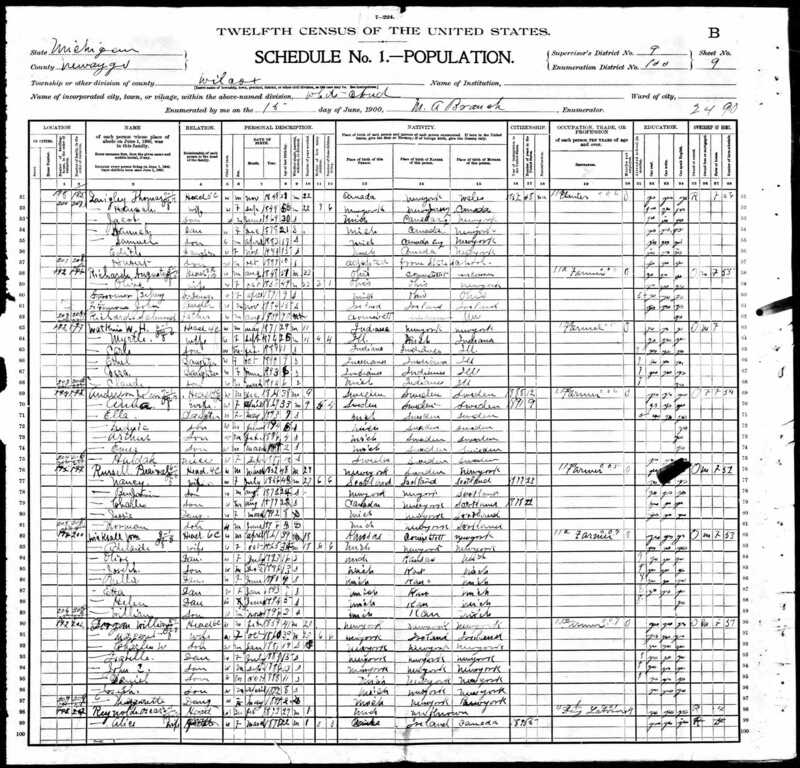 Olive's birth date is derived from the 1900 United States Federal Census which states July 1883 and a Find a Grave record which gives the day. 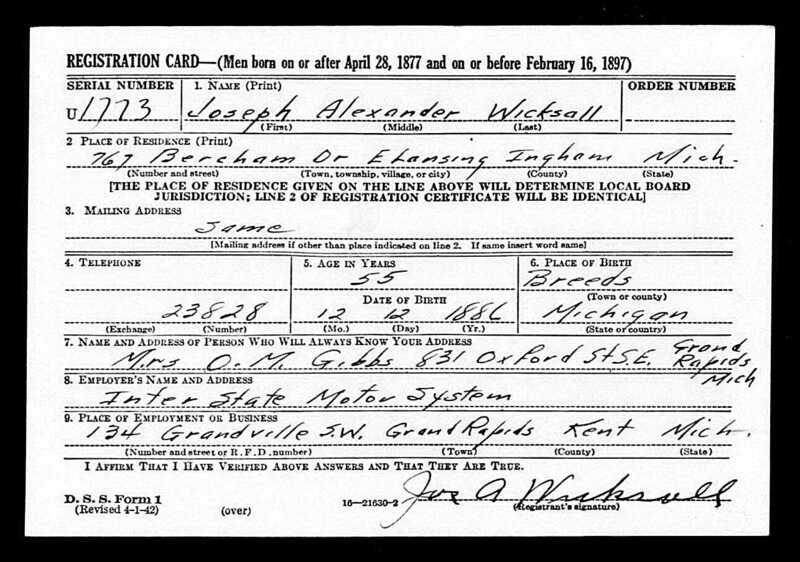 Joseph Alexander's birth date is well documented on his WWI and WWII draft records and on his headstone. One odd thing to note is the way Joseph shows up in Van Buren County Birth Index 1867-1914. Most births have a page number but Joseph, along with several others, is listed as "del." in different handwriting. According to the Clerk's Office in Paw Paw, "del" is short for delayed. 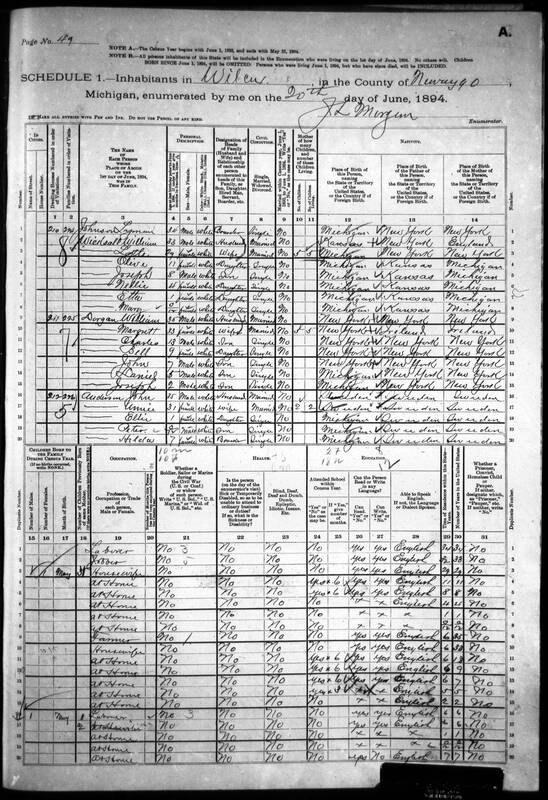 This means Joesph's birth was never registered but a certificate was requested in 1942. On June 18th 1890 William's daughter Nellie Grace Wicksall is born in Michigan. 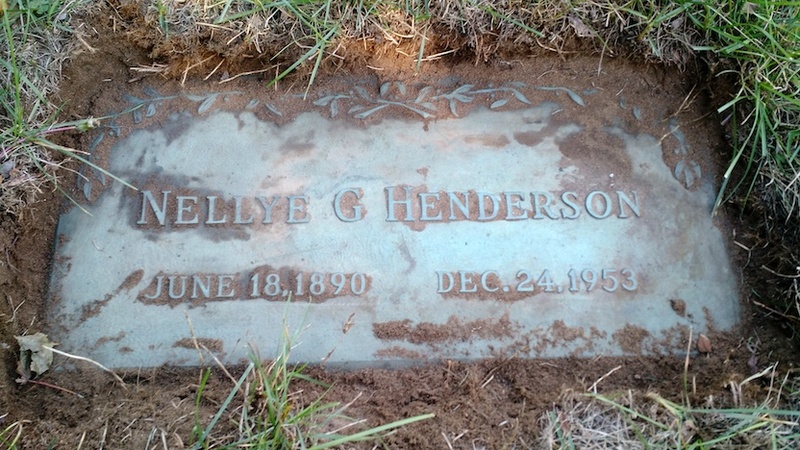 Nellie's birth date is derived from her headstone. 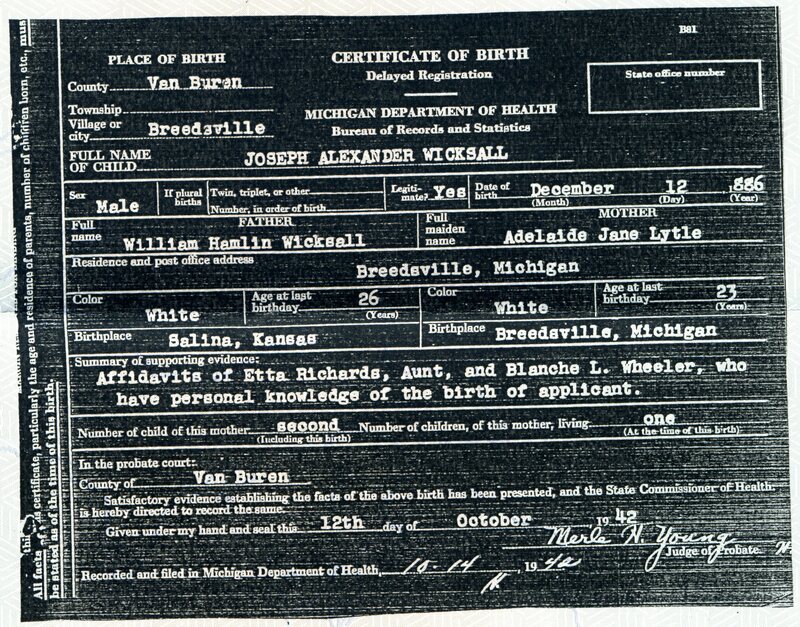 On January 27 1893 Ada Vietta Wicksall is born in White Cloud, Newaygo, Michigan. 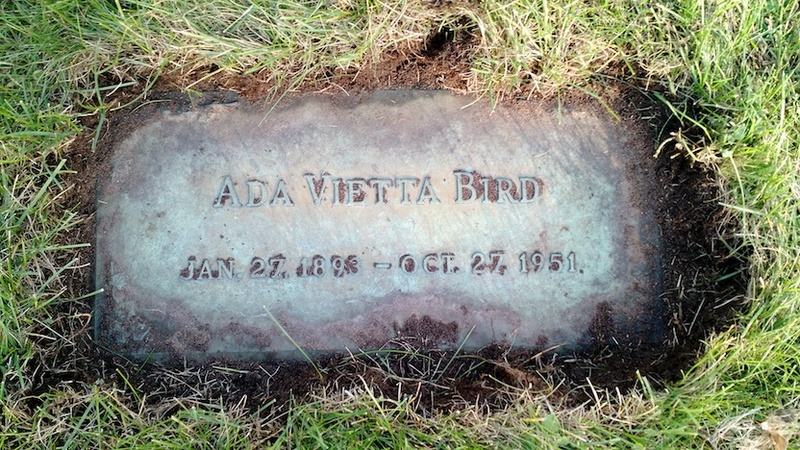 Ada's birth date is derived from the 1900 United States Federal Census which states Jan 1893 and her headstone. 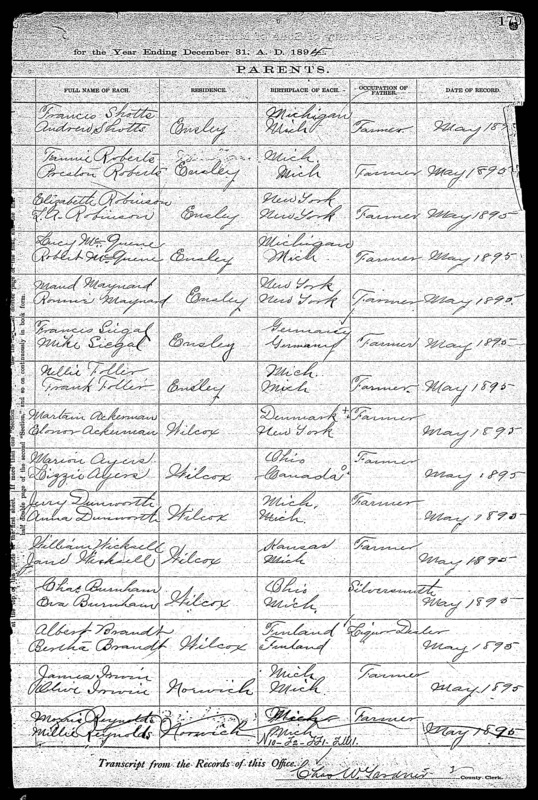 There is a little confusion around her birth date as Part 1 and Part 2 of a page out of Michigan Births 1867-1902 has an entry for Vi Ecta Wicksall on June 27 1892. I believe this confusion is due to the fact that this index wasn't recorded until July 1893 and the entries are out of order. Most likely there was an issue reading the original source material. This is the first indication that William Hamlin has moved his family to White Cloud. On June 4th 1894 Helen Julia Wicksall is born in White Cloud. 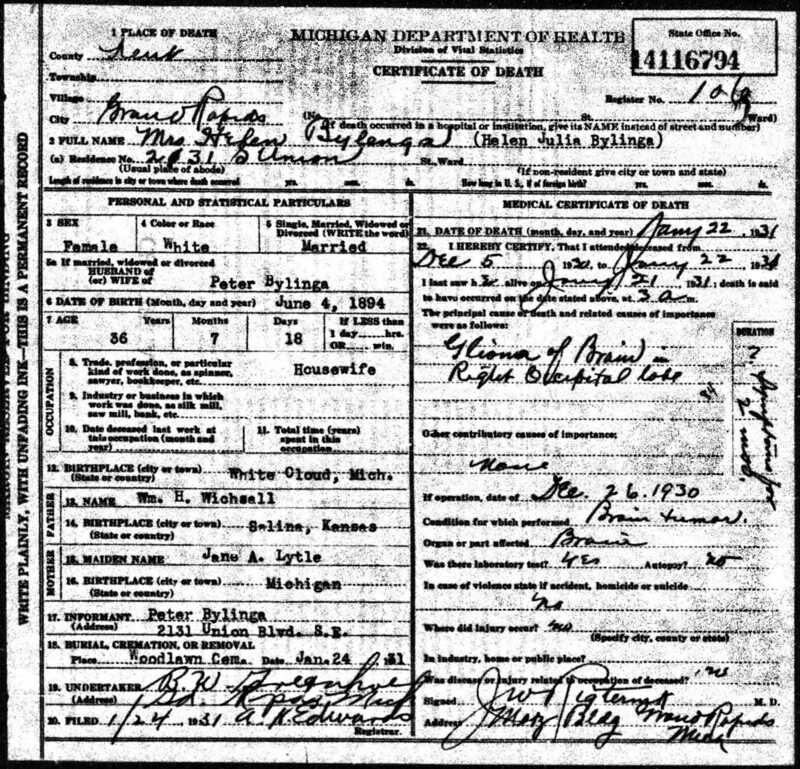 Her birth date is derived from the 1900 United States Federal Census which states Jun 1894, Part 1 and Part 2 of a page out of Michigan Births 1867-1902 and her death certificate which shows her full birth date and parents. 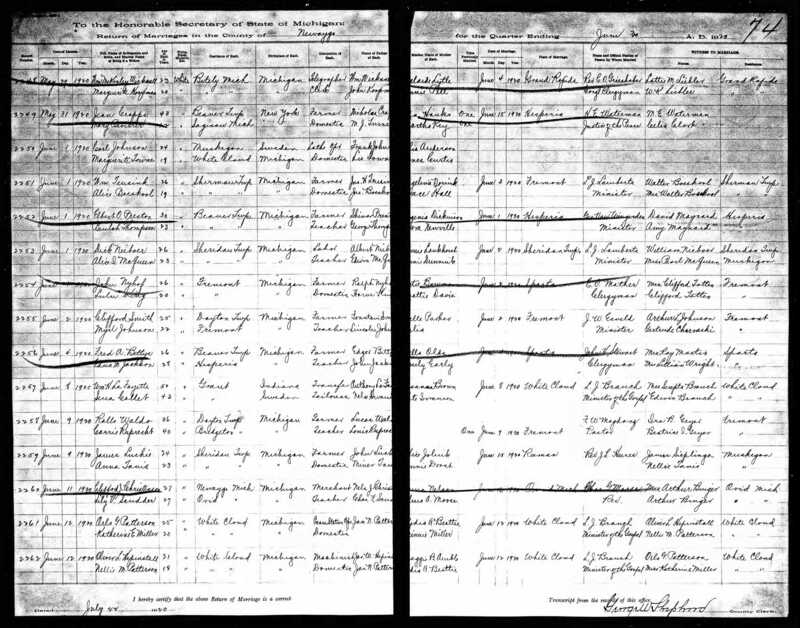 On June 20th 1894 the family shows up on the 1894 Michigan State Census. William, Addie and the children are all listed. There are a couple of odd things worth mentioning here. Addie is listed as her maiden name 'Lytle' and Helen appears as Mary at the correct age of 0 months old. 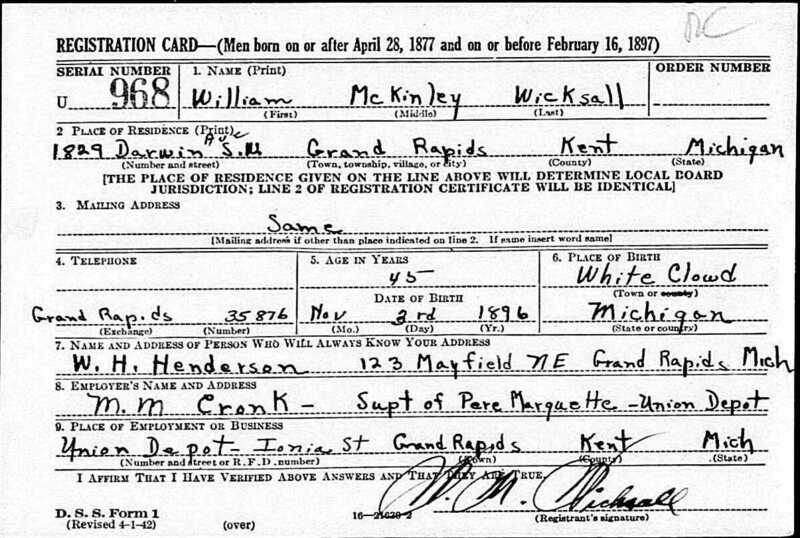 On November 3rd 1896 William McKinley Wicksall is born in White Cloud. 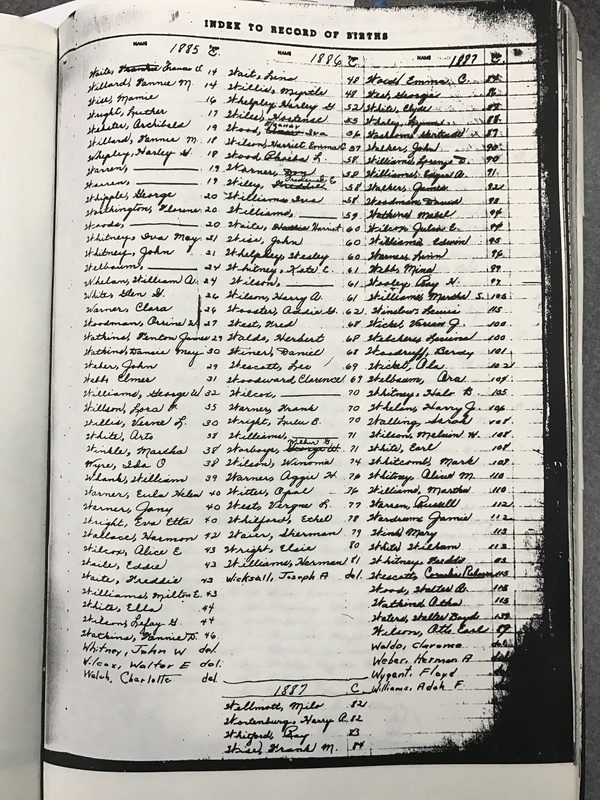 There is some confusion around his birth date as his WWI registration says March 3rd 1897 while is WWII registration and Social Security listing both say November 3rd 1896. 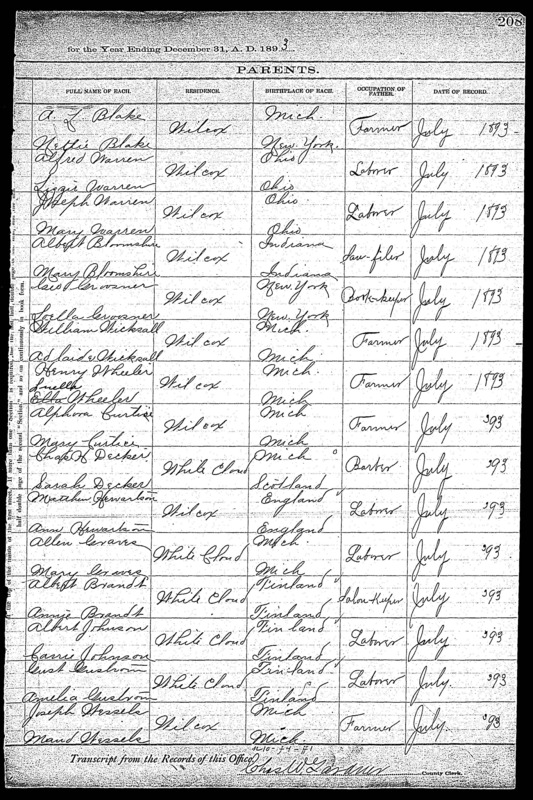 As mentioned numerous times already, the whole family up to this point is listed on the 1900 United States Federal Census living in White Cloud. On the list are William (H), Adelaide, Olive, Joseph, Nellie, Etta, Helen and William. William's occupation is farmer. William appears to be in contact with his younger brother since on page 12 of the October 3rd 1900 issue of the Hartford Day Spring it states "Attorney Guy J. Wicksall left Wednesday, for White Cloud to visit his brother." On January 19 1902 Olive S Wicksall marries Orley M Gibbs in White Cloud. Later that year Ruth A Wicksall was born in White Cloud. 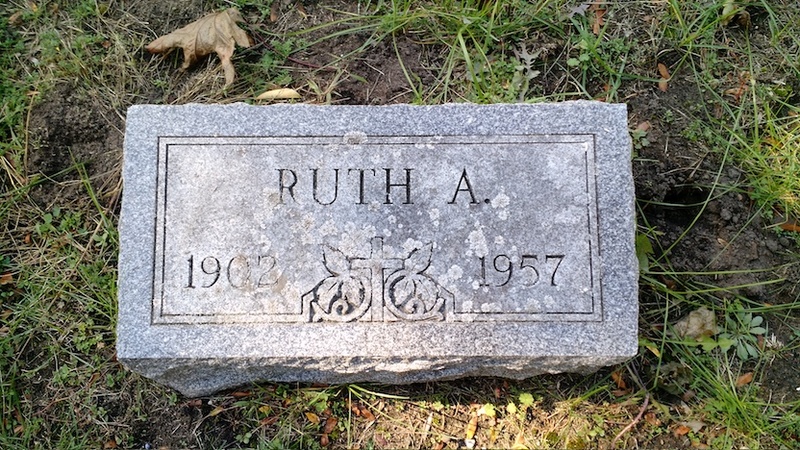 Ruths's birth date is derived from her headstone and the 1910 United States Federal Census. 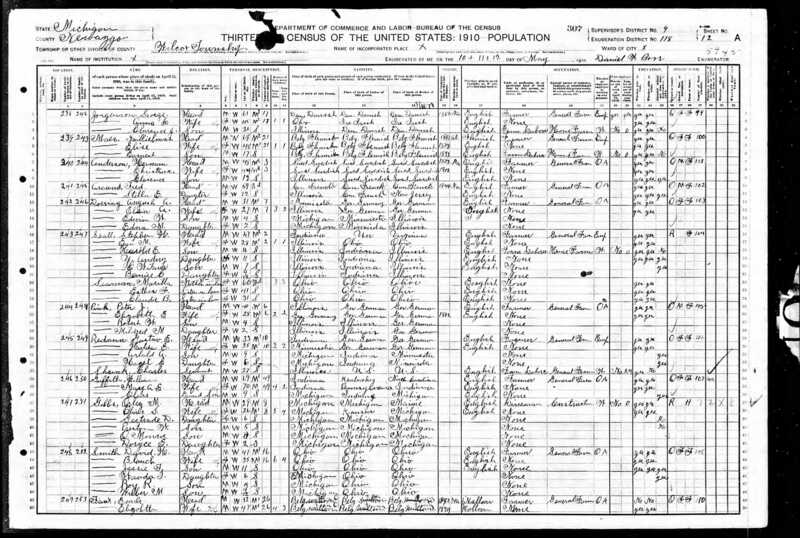 The 1910 United States Federal Census shows that both Olive Salena and Joseph Alexander are no longer living with the family. 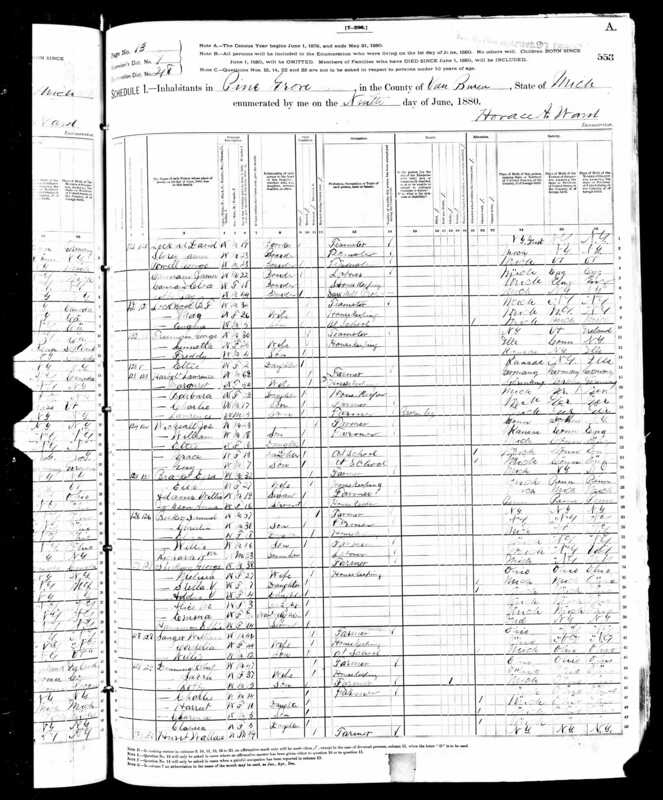 The Federal Census shows Joseph living in Muskegon City Michigan as a single Boarder. 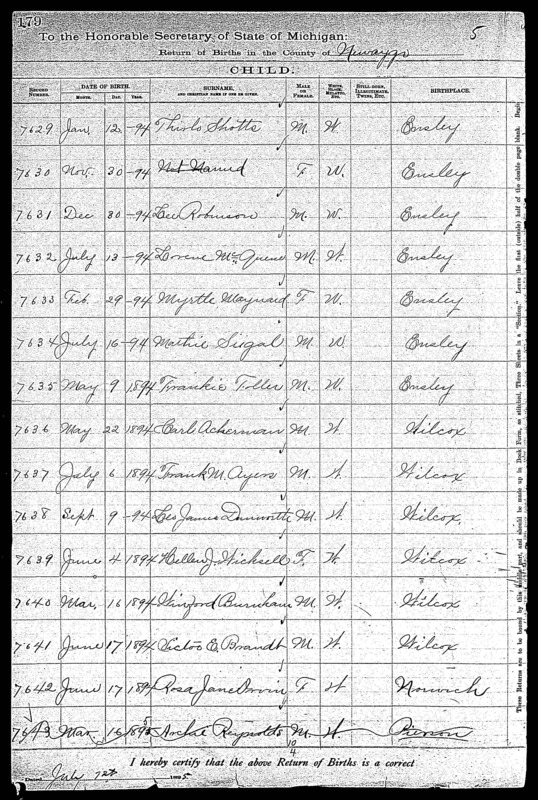 Olive is listed on the census as living in Wilcox Township with her husband and four children. 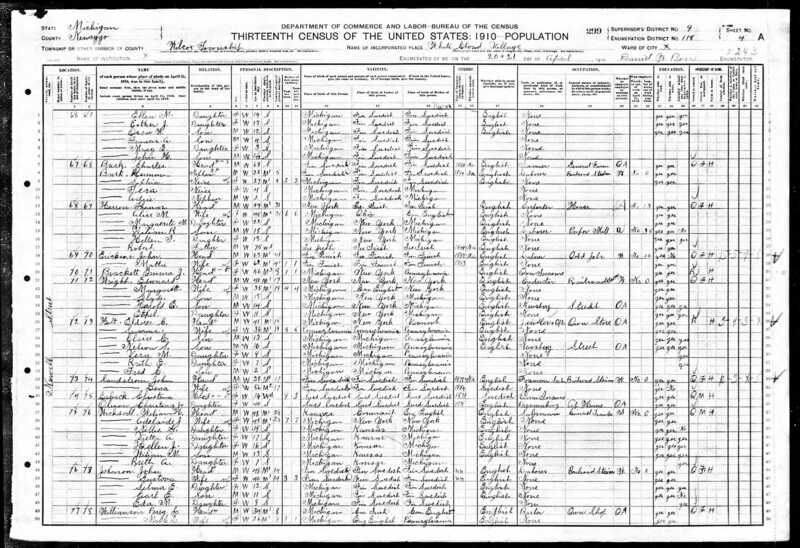 The remaining family members in William's household are living in Wilcox, Newaygo, Michigan and listed as William H Wicksall, Adelaide J, Nellie G, Vietta A, Helen J, William M and Ruth A.. William Hamlin's occupation is now Traveling Salesman. 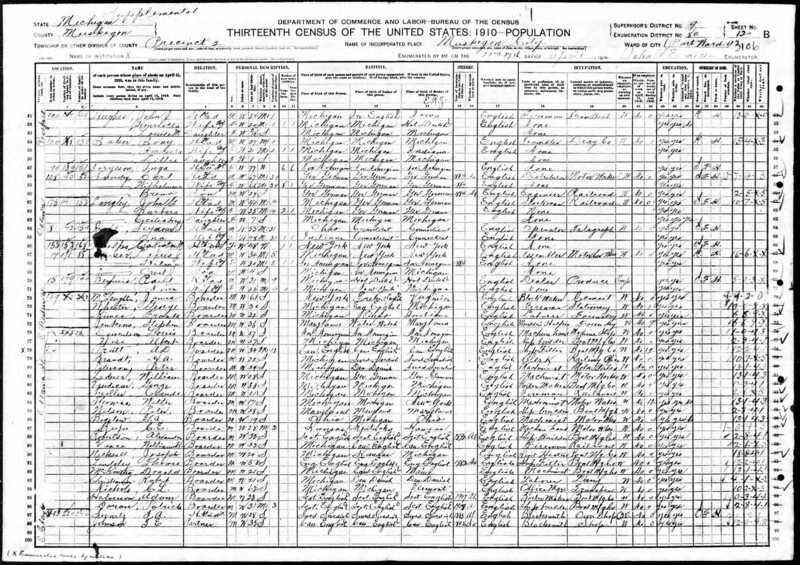 On July 21st 1910 Nellie Grace Wicksall marries Windfield Harry Henderson in White Cloud, Newaygo, Michigan with Ada Vietta Wicksall as a witness. Windfield's occupation is Telegrapher. 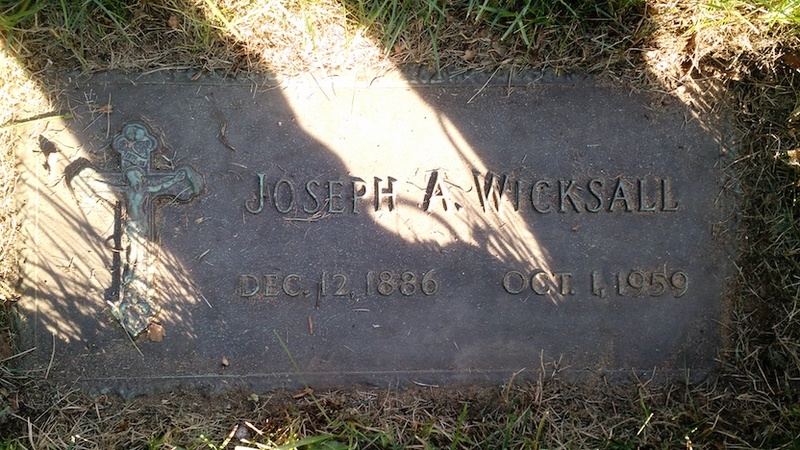 On December 17th 1910 Joseph Alexander Wicksall marries Marguerite Elizabeth Fox in Grand Rapids, Kent, Michigan. Joseph is an Electrician while Marguerite is a school teacher. 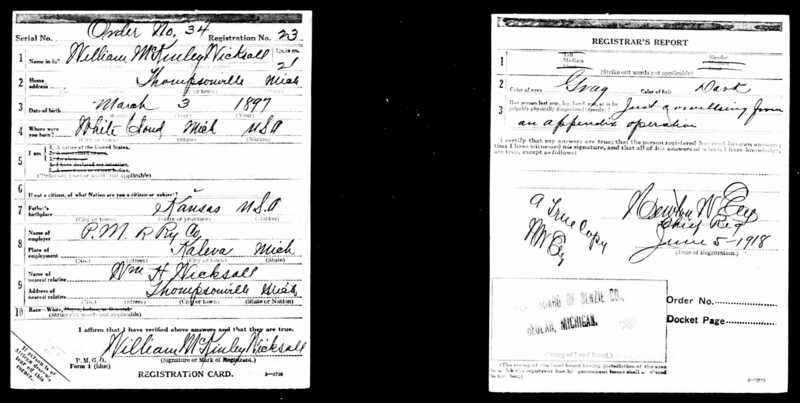 On March 12th 1911 Ada Vietta Wicksall marries George E Bird in Grand Rapids, Kent, Michigan with Joseph Alexander Wicksall as a witness. George's occupation is Telegraph Operator. On June 4th 1920 William McKinley Wicksall marries Marguerite Koopman in Grand Rapids, Newaygo, Michigan. William is a Telegrapher and Marguerite is a Clerk. On June 26th 1923 Helen Julia Wicksall marries Peter Bylenga in Grand Rapids, Kent, Michigan with Ruth A Wicksall as a witness. Peter's occupation is Forman and Helen is a Clerk.